Here’s another set of photos from our local group’s participation in the Worldwide Photo Walk. I’m trying to decide which photo to submit. This is the counterweight for a fire escape in downtown Bismarck. I love the sky in the background combined with my vignette. Remember Gary Miller? 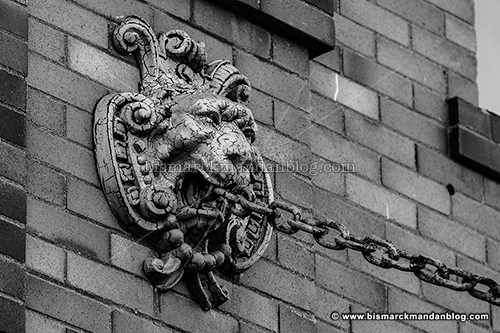 If I remember the walk correctly, and I don’t know why I shouldn’t, this is one of the chains holding up the overhang at the entrance of Gary’s Gallery. I believe this gallery will be closing in the near future, as his wife had announced something about it a while back. I love this sign. 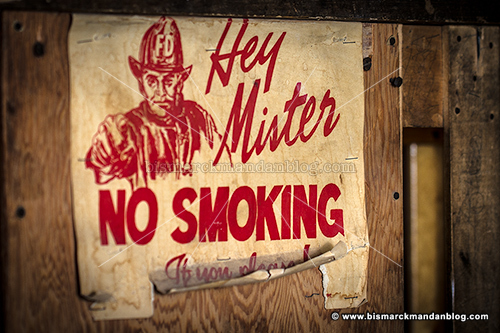 It’s attached to the freight elevator in the Anderson Building, which I hope to own some day. This elevator is no longer available to the public. I remember hearing a news report in the late 80s or early 90s about a young girl getting her arm pinned and amputated by this elevator. That’d do it. I’ll shoot myself in the foot by saying that these three are my favorite of the bunch. I do have a couple more, but they don’t mean as much to me as these. I’ll post the other ones soon and hopefully receive your feedback in time to upload my selection to the Photowalk website. Our photo club took part in the Worldwide Photo Walk this past weekend, and it was a blast. I didn’t stay for the entire window of time because of other errands, but I did walk around downtown Bismarck for two hours with a couple of photo pals. 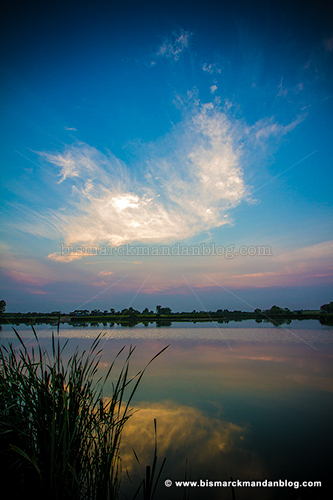 Each member of each local photo walk submits one photo to the group. The group them forwards one photo on to the worldwide walk, and so on. I got a few shots that I like with my brand new lens, and I need some feedback as to which I should submit before the deadline. This was right at our starting point in front of the historic Belle Mehus Civic Auditorium. I tried to go for sort of an optical illusion effect. On the other end of downtown, I found this little nook in the back of the Anderson Building…a building I one day hope to own. The frame gave it a nice splash of color. Made in North Dakota. 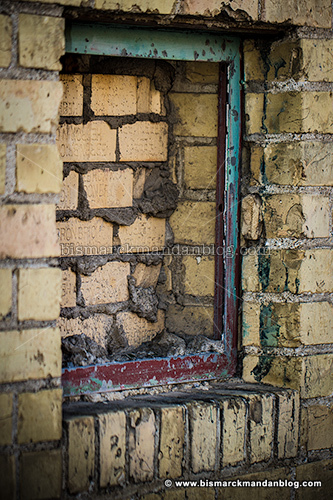 These are the bricks which sealed shut the window in the last photo. Good ol’ bricks and mortar, compliments of Hebron. 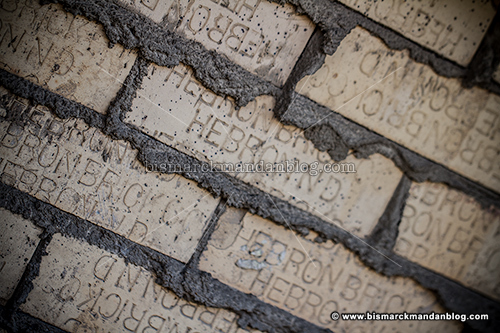 I did take photos of more than bricks, but I thought I’d share these first three together due to the similar subject matter. The ones I really like will be posted next. Shoot me an email or post a comment when you find your favorite! Little boy loaded in the truck: check. Camera bag and tripod: check. Sandbar with grit getting everywhere: check. Battery…battery? Oh, seriously. I even have a dual battery grip on my 7D, so how in the world did I get Munsoned out in the middle of nowhere? Well, as you can see I still had something capable of taking photos with me: another Canon DSLR in its bag, which I’d forgotten to remove from my truck yesterday. Fortunately, I realized this just in the nick of time, and was able to catch the sun just as it was about to disappear over the horizon. I was in the best spot I could think of on short notice, and I think it paid off nicely. Then we came home to watch Courageous with the rest of our little family while I stuck batteries into the charger. First is this gaggle of geese. 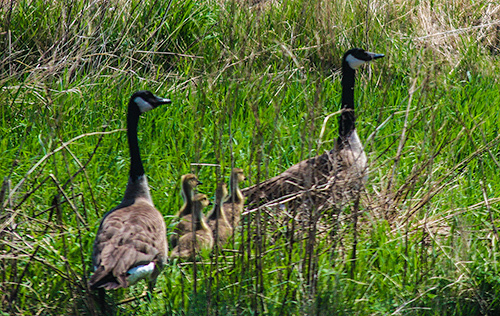 I had to double-check my terminology to make sure that I was right, and apparently a “gaggle” is at least five geese. 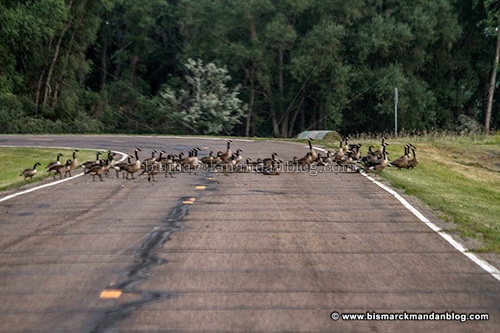 This bunch easily meets the requirements and, although they were plopped down as if they owned the road, I was able to convince them quite quickly that it was time to move. 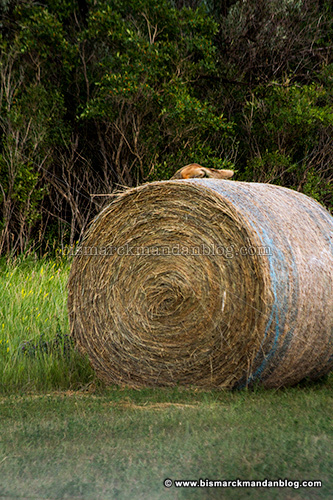 Just prior to that, I’d spotted an unusual sight: a fox laying on top of a hay bale. He had his front paws out in front of him and was just lounging around as we passed. I grabbed a telephoto lens and a camera and circled back, but this time he must have seen the lens or something…and scampered away. Shot missed. The sky played a cruel one on me today: the clouds moved in, obscuring the sun and the horizon. That’s okay, I had a Plan B: catch some nice reflections in the calm water of the lake. That worked. Because of the advancing clouds and haze of the sky, it got dark quickly and it was time to head for home. It wasn’t the result I was looking for, but it was a good night nonetheless. 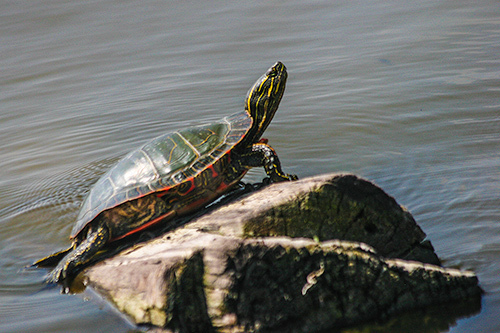 This was one turtle who didn’t dart into the water right away as we approached. He was patient enough to let us put a 300mm lens on my boy’s camera and snap away for a while. These geese didn’t like us much. They swam over to the far shore and got out to walk away. The funny thing is, they came to the end of the land and had to plop back into the water anyway. Then there’s this guy. He posed for us briefly before taking off. 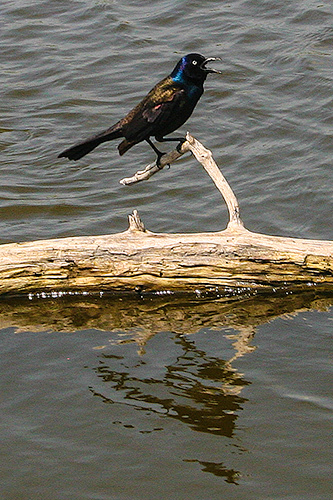 He had a pretty nice perch until we came along and made him uncomfortable with all the cameras pointed his way. Then I took another boy for a trip in the opposite direction! We didn’t approach any water at all, but we did find plenty of scenery. 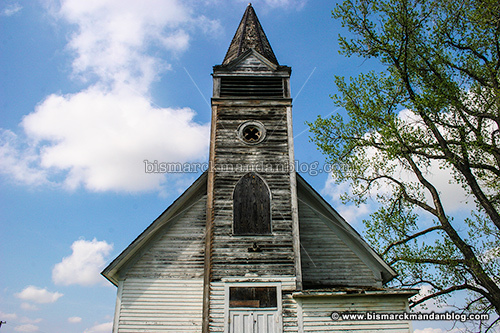 He didn’t have a wide enough lens to get the whole church in Almont into the frame, but he did frame a nice level shot. I didn’t have to crop it or anything! 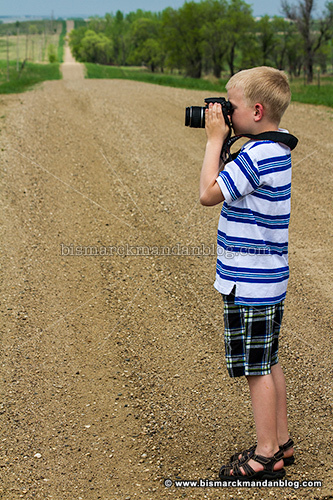 There are plenty of grown-up would-be photographers who can’t frame a level shot. One of his favorite subjects: Daddy. 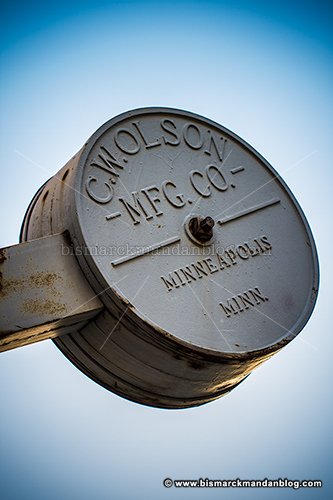 This is that old piece of farm equipment I posted recently. This one was taken from the truck, as it was getting late and we were running out of snacks. 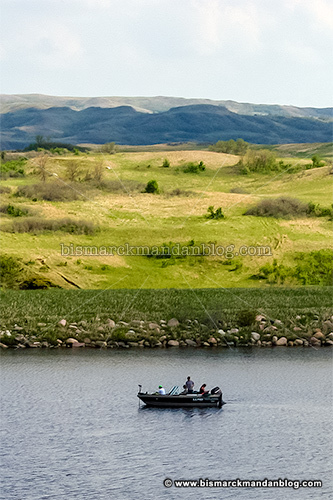 We ventured out to Fish Creek Dam, where we were a trio of kayaks and this fishing boat. You can see from the background how the clouds were pretty spotty. There were long periods of shade as enormous clouds passed over. I was so happy to get out with my camera not once, but twice. I was even more happy to do it as a father-son trip, also twice. I haven’t been able to use my cameras for a while, so to get back into the swing of things for now has been very therapeutic. After dozing off early in my recliner tonight I woke up to a text from a friend who was out on patrol tonight. 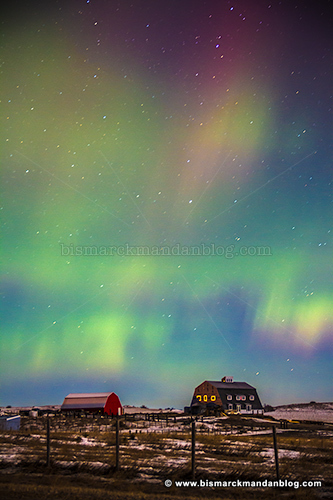 He noticed that the Northern Lights were in full swing. I grabbed a good friend, hopped in the truck, and took off. We were not disappointed. As I mentioned recently, I’ve had some health issues and other things that have just plain sidelined me as far as photography and blogging. 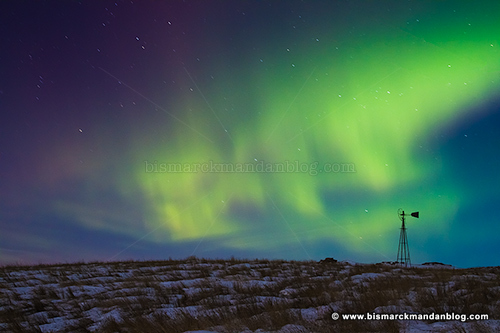 This was a great way to get back in the saddle for a bit as much as my pain would allow, and happens to have been one of the better aurora borealis nights in a long time. Just because I’ve been in my recliner doesn’t mean I haven’t been watching what the sun and skies are up to. 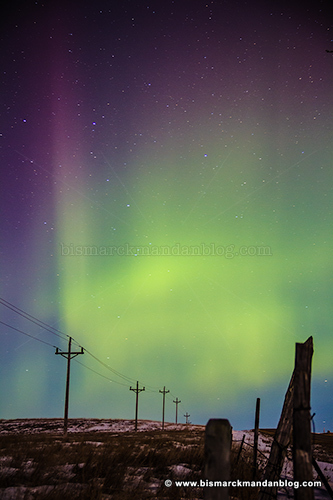 We appear to have arrived along one of my favorite rural roads just in time to see some very spectacular lights. 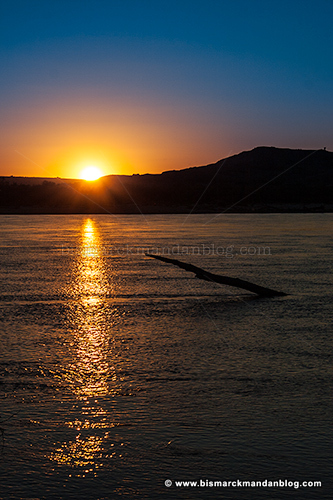 We saw spikes, we saw ripples, and we saw a lot of them. I worked the area the best I could within the time allowed, and we pointed the truck back toward the Bizzo once things began to taper off. I can’t speculate on the frequency with which I ease back into my beloved photo hobby, but hopefully this is a harbinger of good things to come. With the weather changing in our favor and another spring and summer on the way, things are looking pretty good. I hope to be on the mend in time for mountain bike and volleyball season, too! One of my favorite subjects in this ongoing photographic adventure has always been the old windmill. I’ve got some old standbys that I can visit if the sky is looking dramatic. Some of them have even vanished, such as the one that was along Apple Creek Road across from the old Farmers’ Livestock Market. This one is not likely to vanish anytime soon. What’s better is that it’s on a slight hill, with easy access right near the road, and it’s short. Why would that matter, you ask? Perspective. 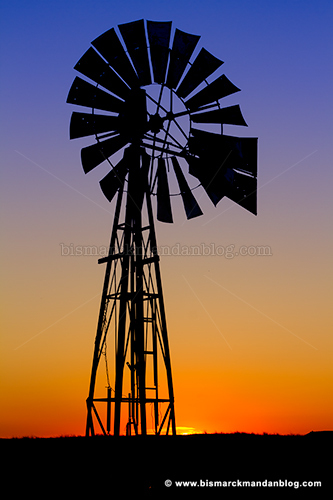 It’s possible to get a variety of really cool angles on this windmill while including the prettiest parts of the sky – and even the horizon at times – due to its position and diminutive stature. I haven’t been able to get out with my cameras in a while; in fact, I’m not exactly sure where all of them are! 2013 has been that kind of year. I hope to get out some more, especially since I’ve missed autumn, but for now I still have a few unused photos that I really like, “in the holster” for posting and sharing. With the weekend only a couple of days away, maybe a photo trip is in my near future! I had a very short window to try to get some photos in, something that hasn’t happened in a while. 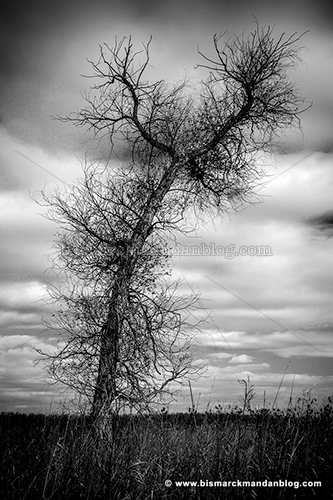 I’ve pretty much missed most of the foliage, I think…so, since the trees are looking all bleak and nasty, I figured I’d try to find a spooky tree photo. As a Christian I don’t do the Halloween thing. That’s not what I’m going for. I knew that the Apple Creek Wildlife Management Area south of town was a fertile ground for nasty looking trees, so I bolted down Sibley Drive to South 12th Street. Many of the best looking trees were in poor locations, but this thing sure looked gnarly with some interesting geometry. Thus it was my subject for a little while before I had to bolt back home. 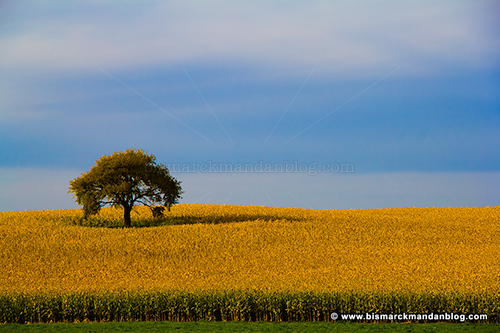 I’ve known of this tree for years, and even tried to get some photos of it, but never found myself in the Valley City area at a time where the field and the skies were really conducive to a good shot. Thankfully I had good timing as I drove past it this week and was able to pause to snap a few quick shots out the window. My friend Ken still has the best photo if this tree that I’ve ever seen, but even in my haste I think I was able to get a couple of satisfactory shots. It’s all in the cropping. 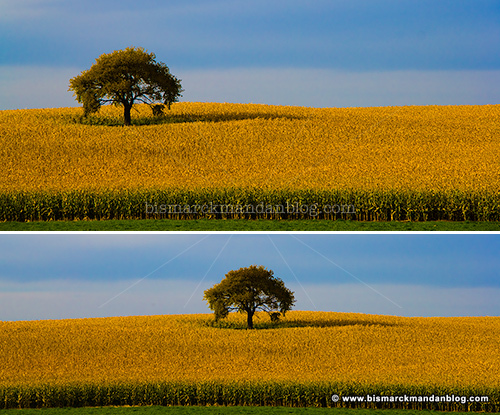 By deviating from the standard 4×3 aspect ratio and making the shot appear wider I was able to convey the unique solitude of the tree out in the middle of the expanse of the field. 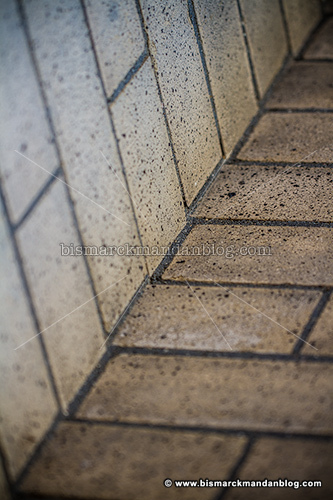 Above are a couple of examples. I wish I’d have shot a little wider for a few frames to produce a few with even more background, but these will have to do…until next time. This has been an incredibly busy year, both with work and with being husband and Daddy. 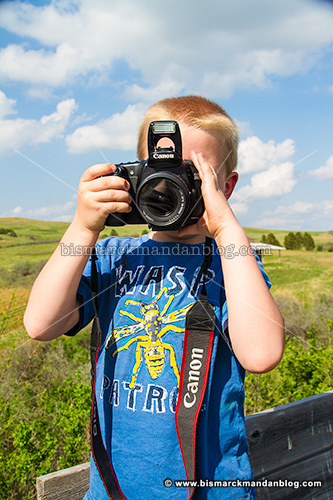 I did take one of my cameras with to Papa’s Pumpkin Patch this past weekend to accompany my boys, and I did get a couple of decent zip-line photos, but for the most part it was unremarkable photographically. I was just following my little dudes around and letting them enjoy the day and the amazing autumn world the PPP folks have assembled once again this year. 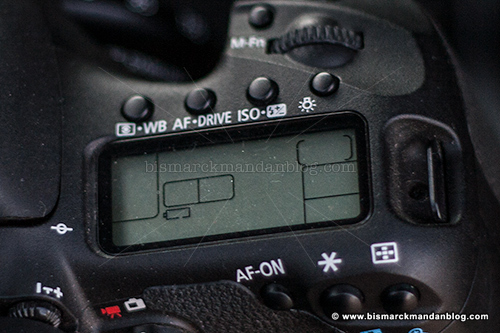 I did hit a milestone, on this particular camera I crossed the 28,000 photo mark. That’s what’s pictured above. 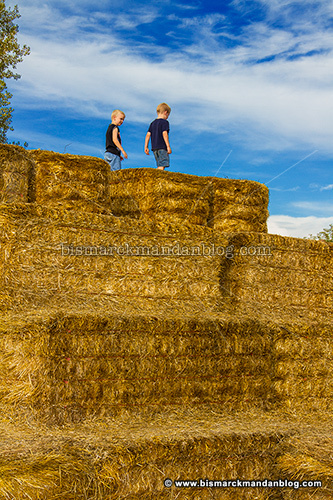 While not a remarkable photo, it did what I wanted for memory’s sake: show my little dudes atop a large pyramid of bales with blue sky and a little bit of green leaves in the background. That’ll work. If you haven’t gone to the Patch yet, make sure you do so before it’s too late! You can check out their schedule and other information at www.papaspumpkinpatch.com – they even post weather updates there so you can find out if they’ve closed due to rain or other factors. They also have a Facebook Page if you’re into that sort of thing. Don’t let it be one of those things you plan to do but then never accomplish before the season suddenly passes you by! Do you like what you see here? Get notifications of new drivel whenever it’s posted! TEN YEARS. Still missing Wade.